Today at the Microsoft Build developer conference, we are announcing a partnership with Qualcomm, one of the largest mobile and IoT chipset manufacturers in the world, to jointly create a vision AI developer kit. 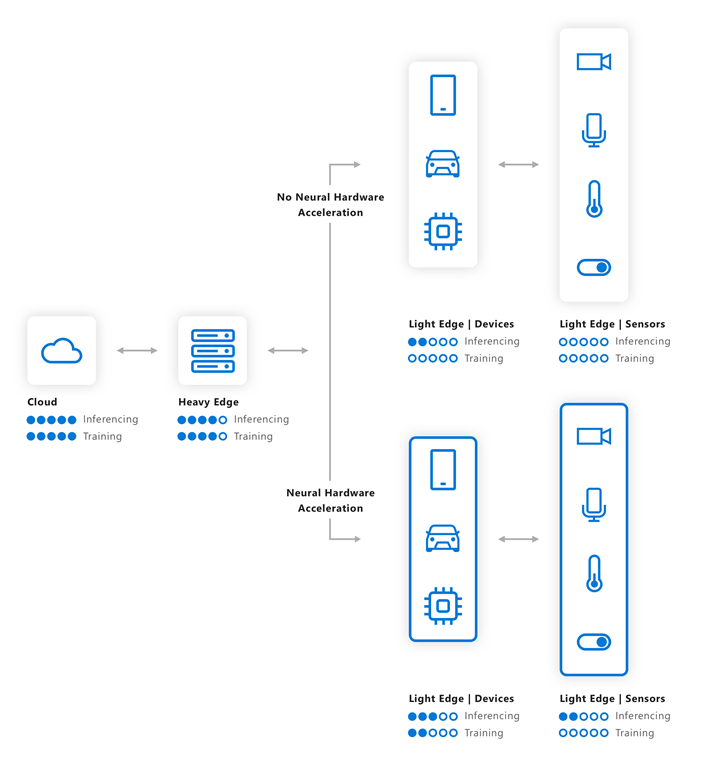 This will empower Qualcomm’s latest AI hardware accelerators to deliver real-time AI on devices without the need for constant connectivity to the cloud or expensive machines. This vision AI developer kit brings all the key hardware and software required to develop camera-based IoT solutions using Azure IoT Edge and Azure Machine Learning (ML) – helping innovators deliver the next generation of AI-enabled robotics, industrial safety, retail, home and enterprise security cameras, smart home devices and more. This is a crucial step toward enabling developers to easily create, manage and monitor AI on the edge. This partnership allows developers to start building AI offerings with prebuilt solutions — including customizable models — or create new AI models and deploy directly to the cloud or to the new hardware accelerated devices. They can do so using the same powerful IoT Edge platform they have been using to manage other IoT devices and edge deployments — use a single pane of glass to manage all their AI assets across the cloud and the edge. The first device out of this collaboration is the vision AI developer kit. 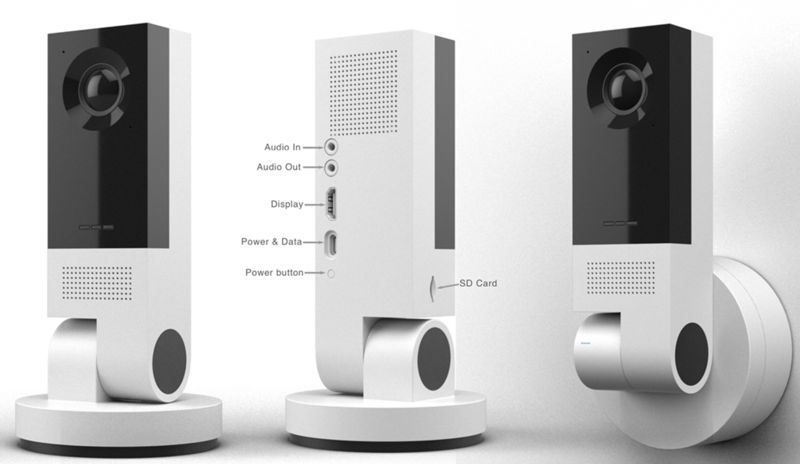 This kit is based on Qualcomm® Vision Intelligence Platform powered by Qualcomm AI Engine with fully integrated support for Azure ML and Azure IoT Edge. This platform can run AI models locally on the device with support for hardware acceleration to enable real-time vision AI performance. Azure ML is responsible for AI model creation and monitoring, while device management and deployment are enabled by Azure IoT Edge. 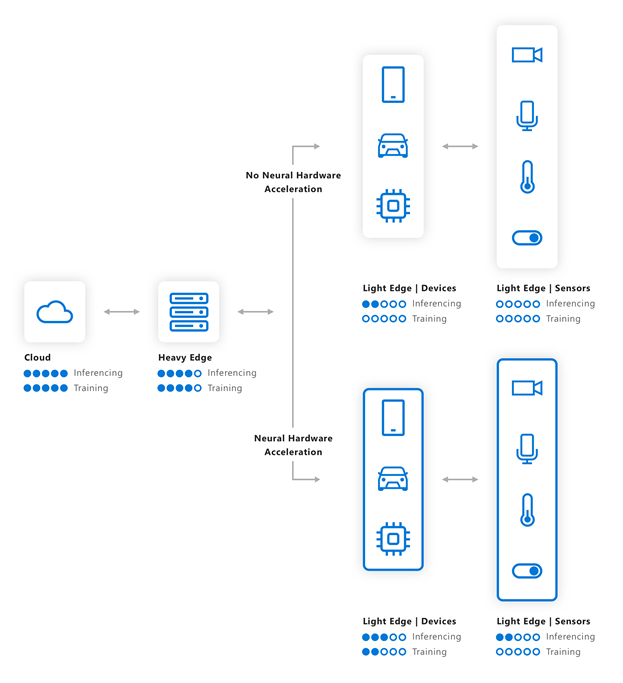 The Qualcomm® Snapdragon™ Neural Processing Engine (NPE) powers the on-device execution, making the kit one of the most powerful intelligent edge devices and the first fully accelerated platform supported end-to-end by Azure. This device fosters the creation of a whole ecosystem that is fully supported by Azure ML, empowering anyone to create the next generation of enterprise-ready AI devices. Our goal is to distribute access to AI across the cloud and the edge to empower more devices and people to benefit from machine learning and neural networks. In the past, machine learning at the edge required powerful and expensive machines known as “heavy edge” but are limited by continuous power supplies and direct connectivity to all sensors, making deployments constrained and expensive. Even with the ability to run advanced machine learning algorithms on the “light edge,” the process to build and manage these models remain obscure and challenging. 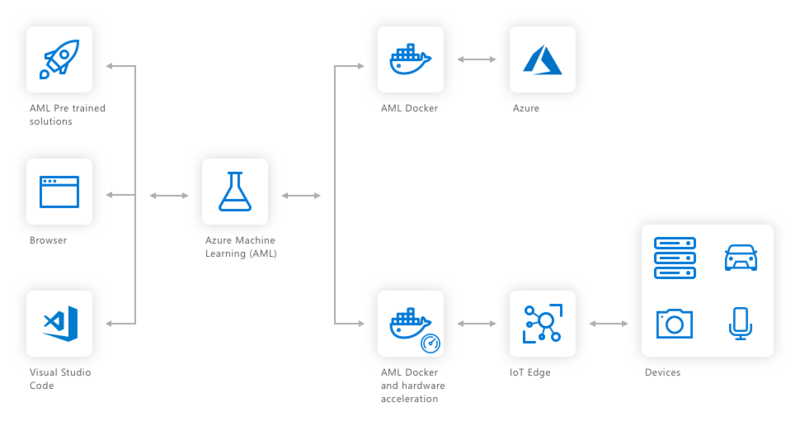 Azure IoT Edge greatly simplifies deployment and management of edge devices by doing the heavy lifting such as secure initialization, payload deployment and monitoring for all the Azure services that IoT Edge currently supports. In addition to Azure Machine Learning, Azure IoT Edge supports Azure Stream Analytics, Azure Functions, Azure SQL Database and custom code. 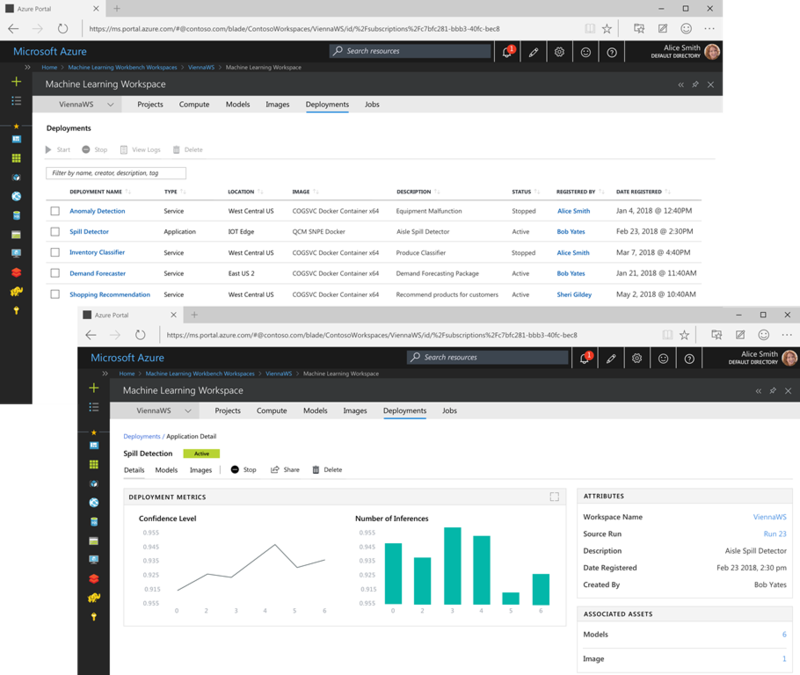 Leveraging Azure ML to deploy and manage these models allows companies to use a single pane of glass to monitor all their Azure ML managed AI assets — whether they are deployed to the cloud or the edge. While the Intelligent edge will be available for private preview during the summer, you don’t have to wait until then to start creating models that will run on the device. Please register here to be considered for early access to the platform and preferred ordering for the preview units.